On the first day after foliar application, chitosan pentamer (CH5) and chitin pentamer (CHIT5) decreased net photosynthetic rate (PN) of soybean and maize, however, on subsequent days there was an increase in PN in some treatments. CH5 caused an increase in maize PN on day 3 at 10−5 and 10−7 M; the increases were 18 and 10 % over the control plants. This increase was correlated with increases in stomatal conductance (gs) and transpiration rate (E), while the intercellular CO2 concentration (Ci) was not different from the control plants. PN of soybean plants did not differ from the control plants except for treatment CH5 (10−7 M) which caused an 8 % increase on day 2, along with increased gs, E, and Ci. On days 5 and 6 the CHIT5 treatment caused a 6–8 % increase in PN of maize, which was accompanied by increases in gs, E, and Ci. However, there was no such increase for soybean plants treated with CHIT5. In general, foliar application of high molecular mass chitin (CHH) resulted in decreased PN, particularly for 0.010 % treated plants, both in maize and soybean. 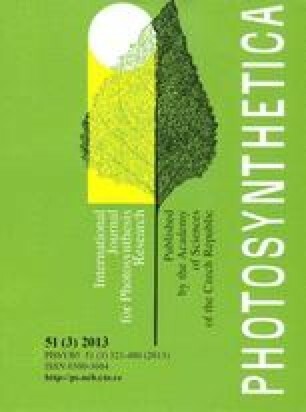 Foliar applications of chitosan and chitin oligomers did not affect (p > 0.05) maize or soybean height, root length, leaf area, shoot or root or total dry mass.